This week was awesome! I don't know if I've mentioned how great my companion is? Well if not, she's awesome and I love her. This week was super fun and successful. We just work so well together - I really couldn't have asked for a better last companion. This week we had an amazing lesson with Johnny. We taught him about the plan of salvation and he shared some very cool experiences that he has had in his life recently that have helped him to come to know of and feel God's presence in his life. The Bishop of the ward here accompanied us to the lesson and as he shared his testimony of eternal families and the importance of the Atonement of Jesus Christ in his life, Johnny became emotional and once again told us, through tears, about how he has found God, how he has increased his faith, and how his life has changed. I really have no words to describe what was said or what happened in that lesson. I am just so grateful for the chance I have had to see that change come to pass. You guys - Johnny has changed so much ever since I met him. Back in December, He wasn't even sure if God really existed or what faith was, and now he is a completely different man. Even though I probably won't be here to see him get baptized, I was able to witness the miracle that happens when people let Jesus Christ change their lives. Johnny truly is a miracle. Let's see what else happened this week... Oh yeah! GENERAL CONFERENCE! Seriously, it was like Christmas. Haha - we brought our feast! I especially related to that last quote by Elder Holland because it perfectly describes not only our life on the gospel path, but it made me reflect on the great journey I have been on for these past 18 months. As cliché' as it sounds, these last 18 months have changed me and my life so much. I truly came here as I was, with no expectations and let me tell you…the Lord did not let me stay like that. Haha okay, so I’m so beyond grateful to my Heavenly Father for blessing me with the most amazing companions. To start, he gave me a spunky red-head, Hermana Brown, to help me survive and enjoy the incredible experience in the MTC. Then he blessed me with not one, but two amazing trainers (aka MadresJ). 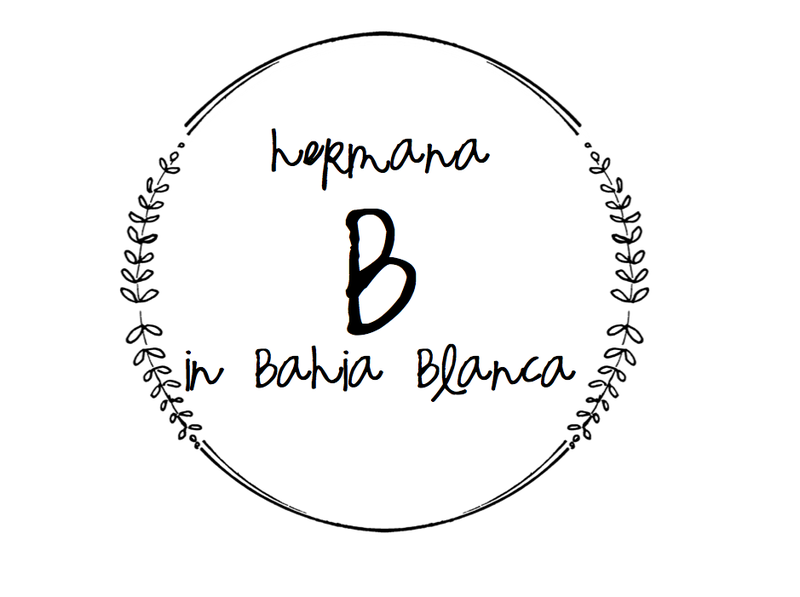 Hermana Palma and Hermana Baird taught me how to be a missionary. They taught me how to love others, be myself and enjoy the mission. I will never forget how loved and important my “Moms” made me feel and all they did to help me get used to life in a different country and culture. Next, I got 3 happy months with my little cute and favorite Mexican, Hermana Cardenas. We went through lots of up and downs together and she stood by my side through it all. She taught me how to be FELIZ in the mission and in life. Later came my 2 precious hijas - Hna. Ahlmer, a hometown friend, followed by Hna. Quenta, her Peruvian little sister. Whether it was walking and sweating through the hot Bahia summer on the dirt streets in Villa Floresta; or memorizing every single street and house for 9 months in my little pueblito Olavarria; or preaching the gospel in the smelly-fish port of Mar del Plata, I have made some unforgettable memories here in Argentina as I've shared the happy and hopeful message of the restored gospel of Jesus Christ with my brothers and sisters. Now, don't get me wrong, it hasn't been all sun and roses, but even on my darkest days, I have hit my knees at the end of the day thanking my Heavenly Father for every single moment - for all the members here that have taken such good care of me, for all the miracle investigators that I got to see change their lives, for every single person that I met in the street or on their doorstep these last 18 months - even those who didn't want anything to do with us Mormons, and for every lesson I learned from studying the scriptures and for truly coming to know my Savior. The truth is, I don't think I'm ready for it all to end... to be over. President Dieter F. Uchtdorf said, "In light of what we know about our eternal destiny, is it any wonder that whenever we face the bitter endings of life, they seem unacceptable to us? There seems to be something inside of us that resists endings. The more we learn about the gospel of Jesus Christ, the more we realize that endings here in mortality are not endings at all. They are merely interruptions - temporary pauses that one day will seem small compared to the eternal joy awaiting the faithful. How grateful I am to my Heavenly Father that in His plan there are no true endings, only everlasting beginnings." I would like to end with a scripture found in D&C 76:22 that says, "And now, after the many testimonies which have been given of him, this is the testimony, last of all, which (I) give of him - THAT HE LIVES!" I know my Savior, Jesus Christ lives and loves each and every one of us. I know He has provided us with a way to get back to Him and our Heavenly Father and that He has restored His gospel in these last days to help us know what we need to do to be happy in this life and eternally blessed in the life to come. Thank you all for the love and support you have given me these past 18 months. I can't wait to see you all again! Bueno, this week FLEW by! Lice Stew...boiling all of our clothes is super fun! This weekend we had another capilla abierta and this time Hnas Estrada and Davidson (my old comp) came! So we had a fun sleepover with them and the capilla abierta went very well. On Sunday, my comp and I did a musical number in church with two 10-year-old girls from our ward. We did an acapella mash-up of "I Feel My Savior's Love" and "I Know that My Redeemer Lives." Let me tell ya, we had the whole ward crying. ;) Haha just kidding, but it turned out very well and brought a special spirit to the meeting. Johnny is progressing well. He really has opened up a lot these last couple weeks and is more willing to accept what the Book of Mormon says. For example, when before all he wanted to hear was the Bible, but little by little he has realized that the Book of Mormon is ANOTHER Testament of Jesus Christ, and teaches the fullness of His gospel. Johnny has such a big desire to learn and grow spiritually - it's awesome! Our English class is going well! There's a family in our ward that lived in Utah for 12 years so their sons speak perfect English and it’s so fun to chat with them. We also got our hot water problem fixed so we no longer have to bathe ourselves with buckets and pitchers. :) I'm still in denial that I only have 2 weeks left of my mission but I'm just trying to enjoy every second of it! “I leave with you my witness and testimony that God our Eternal Father lives and loves us. He is indeed our Father, and He is personal and real. May we realize how close to us He is willing to come, how far He is willing to go to help us, and how much He loves us." I add my testimony to President Monson's that God really does love us and wants to help us. One of the ways he has chosen to help us is by giving us latter-day prophets that receive inspiration and guidance from God to be able to tell us what He wants for us and from us in order to be happy. I hope you all enjoy your general conference weekend and can feel of Heavenly Father's love for you every day. So I've got some pretty exciting and terrifying stories to tell you this week. Let's start with the happy highlight shall we? Bien, so Sunday we went to church like always and were having a very normal dia de reposo. We have Relief Society the first hour here - so after the class ended, I looked towards the door and saw the 2nd counselor in the bishopric pointing at us like he needed us for something. As I walked out into the hallway, I saw two familiar faces, smiling and waiting for me. I was beyond shocked, dropped my Bible on the ground (whoops) and ran into the arms of LUJAN!!! The emotion was too much for both of us and we looked like some long lost family members that hadn't seen each other in years (or months J) Neither of us could hold back the tears. Joaquin and Lujan's surprise visit to MDP! Joaquin and Lujan -aka my best friends from Olavarria - were in Mar del Plata to visit a friend for the weekend. With it being Sunday, they figured out where I'd most likely be, and came to surprise me! And boy was that a great surprise! I still can't believe I saw them just yesterday – I’m still on cloud 9!!! We were only able to chat for a few minutes before I had to go to Gospel Principles class and they had to go. I seriously love them so much and feel so beyond loved and grateful for their visit. I was joking with my comp and said it’s nice to know that someone other than my companion, who's forced to be with me 24/7, worries about me, loves me, and makes a special effort to surprise me! I have really found some lifelong friends down here. So yeah, I made it a whole 17 1/2 months without following the example of my older sister and getting lice on the mission... but last night that all ended. :) AHHHH, I HATE LICE!!! Anyway, after going through my hair, I went through my comp's hair for a good 1 1/2 hours. Her’s is a little thinner and shorter than mine so it didn't take quite as long. So if you're any good at math you've probably realized by now that we didn't really get much sleep last night - more like napped. So this week is going to be fun - full of lice-shampoo treatments and exhaustion. So excited!!! It's all part of the experience right?! Well I hope you all had a great week and didn't get lice - I really wish that for NO one. I love you all lots, and miss you too. But like everyone keeps reminding me, I'll be home in no time so why waste the last stretch sad and missing ya'll 😉. Angelica (from Olavarria) got baptized!!! Home-made pizza - Argentine style! Yo? Enferma. Haha that's right, my being sick in the mission curse came but this week. The weather in Mar del Plata has been super crappy and changy (is that even a word? changeable? changing?.. it just changed a lot during the week). It's been windy, rainy, cold and sunny all at the same time and my body couldn't keep up. Neither could my companion's. But we're feeling much better so don't worry! :) It just took some soup lovingly made by my comp and unpacking our warm winter socks. 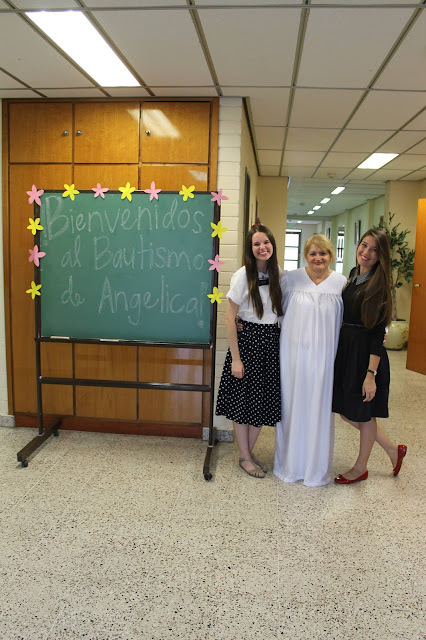 This weekend we participated in another capilla abierta [chapel open house] here in our stake. There's a new missionary couple that got called to our mission - the Allen's. Elder Allen serve his mission in Thailand so he knows zero Spanish. Hermana Allen is from England but lived 10 years in Spain - so she speaks with a crazy Brittish/Spainard (is that how you spell it?) accent. Anyway, Saturday evening we had the Capilla Abierta – and with our bipolar weather week, it rained the entire time... so almost no one came. But it was awesome to see how many members came out to help and how happy they were to be there on a day like that. This week I was asked to speak in Sacrament meeting about the blessings of doing service. I was worried that I wouldn't have a voice on Sunday because of my sore throat and I told my comp that she might have to give my talk for me but it didn't work. :( haha I tried! Anyway, the bishop asked me to share some experiences from my life - not just talking about the mission. Luckily I grew up in a great family with parents that taught me from a young age the importance of service and the happiness and blessings it brings to our lives. One of the examples I shared was an experience my best buddy and little brother, Brandon shared with me about a month ago. He said that one weekend he was bored, with nothing to do and everyone else in the family was busy doing something, so he decided to go to the Bishop's Storehouse by himself to volunteer. How awesome is that? He said he felt so good and really enjoyed it. But my favorite part was that the very next week he wrote me and said he was sad he couldn't go volunteer that weekend cause he decided to go to the Temple with Dad. I am so beyond grateful for the incredible example my brother is to me! I think that the greatest blessing we can receive by serving is that we become more like our Savior Jesus Christ. I know that me and my family are far from being perfect, but I can say with pride and a big smile on my face that we are trying our best to follow the example of Christ and serve and help his brothers and sisters come unto him. I hope you all have a great week and pay extra attention to all the blessings God gives you through your Service! ¡Hola! ¿Cómo están? Yo, bien. 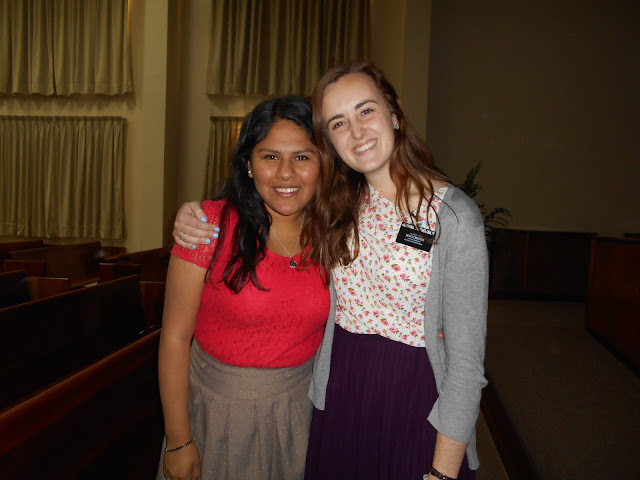 Hermana Green is really awesome though! I have learned so much from her already and it’s only been like 6 days. I’m so excited to work together (even if it’s just for 6 weeks :)). I love my new comp! Gloria is doing great! She likes her new church calling with the niños in the Primary. 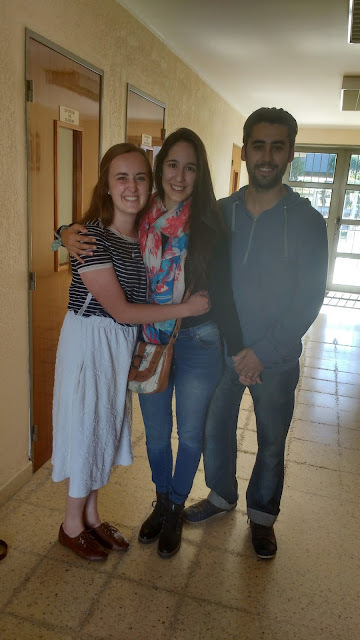 Flavia y Claudio – are just trucking along trying to finish up their paperwork so they can get married and baptized! Johnny – is so fun to teach! He’s so open and honest and really understands what he learns. Please keep him in your prayers so that he can keep progressing and receive an answer to his prayers. This week it decided to rain a TON in Mar del Plata. Especially on Thursday, we left the house thinking it was just sprinkling. By the time we walked 3 blocks, we were soaked! No one was home/didn’t want to answer the door, so we sought refuge in the home of the Bazan Family. They dried us off and put a little portable heater by our feet to warm us a bit – what sweethearts. Haha, so much for summer in MDP. This Sunday, the son of a member here in Puerto got baptized so we helped out by making the invitations, programs, filled the font, etc. My companion sings really well, so she and another hermana sang “Love is Spoken Here” and I accompanied them on the piano. I like having musically talented companions – it makes life more fun. :) We sing 24/7 and try to see who can remember the words to English songs. I’m losing bad! Unless it’s an EFY song or Hymn I’ve forgotten it…but it’s all good! I know that God blesses us for our efforts – so let’s give it all we’ve got, try our best every day to show how grateful we are for the chance to start over and keep trying. Another crazy week has come and gone crazy fast! So sad news of the week - we got transfer calls last night and my comp is leaving me :(. But she got called to be one of the missionaries in charge of the chapel open houses throughout the mission! So we'll get to see her lots in Mar del Plata in the next few months. Well things are going well here in Puerto. Flavia & Claudio are well... Just figuring out paperwork to get married still. They are so ready! I just hope I'm still here when they can finally get baptized. Gloria got a calling this Sunday! She's going to be a nursery teacher. :) She loves little kids so she's very excited. A couple months ago, we met Familia Paredes. Analia, Johnny and their little 4 year old son Gabriel (aka my boyfriend…he loves us!). So they are from Bolivia but have lived in Argentina for the last 10 years! Analia was raised in the church but has been inactive for many years. Johnny was baptized when he was a boy because his uncle told him he would buy him a toy if he did...so he did, but he never went to church again. He was actually raised Catholic but hasn't been active in either church his whole life. Until now. These last 2 months they have been coming to church because they have felt the need to strengthen their faith and become closer to God. They are such good people, so funny and so loving! The ward leaders here sent a request to church headquarters looking for Johnny’s church records and they couldn't find anything. In the church, if there aren't any records/photos/evidence of your baptism, you have to get re-baptized. But it’s not as easy as just dunking him in the water again. Because he was raised Catholic, Johnny has many questions and doubts about the church. But, he is so open and ready to listen to us and really wants to learn and then decide for himself if this is what he wants to do. I'm so grateful and happy for this chance to work with Johnny and his family and help him make the important decision to be baptized. Please keep him in your prayers so that he can feel the spirit and receive an answer that this is the truth! The church is true and I'm ready to finish strong and give these last 6 weeks all I've got! But really, everything went well! Gloria's mom, sister and two nieces were able to come the baptism service, along with her dad who is a recent convert from another ward in our stake. The cutest thing that happened was after the baptism. I asked Gloria how she felt and she was like, "Eh, normal. I guess I didn't have any crazy demons in me...." 😂 That's Gloria for you! She really is such a sweet, innocent, pure girl and even though she wasn't in dire need of becoming clean from sin, she showed her faith in God and willingness to be obedient in following the example of our brother Jesus Christ and was baptized. She has really opened up and changed lots these last few months and we are so happy to have her be part of our big family - here in barrio Puerto and in the church worldwide. This girl was so prepared by our Heavenly Father and we are so grateful that we were able to play a small part in her conversion. Other than that we've just been super busy trying to find new investigators, still. Today for P-day, we had a man who is an investigator being taught by the Elders here in our district, take us in his truck to a cool ocean lookout and then made us asado for lunch. It was beautiful! Today it’s like 90 degrees out, so after I finish writing ya'll, I’m probably going to cool off with some ice cream, like always, before heading back out to work. I hope you all have a great week and know how much I love you!!!! Piled in the back of a truck! Ocean Lookout - So Pretty!! Asado de cerdo - YUM!